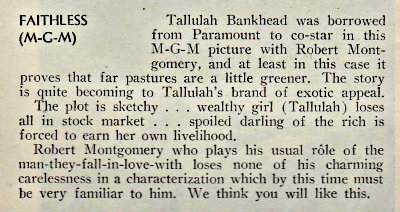 Classic Montgomery - Film thoughts from a modern-day Robert Montgomery fangirl: "The-Man-They-Fall-In-Love-With"
Just a couple Bob mentions from the December, 1932 issue of "Modern Screen". I like the reviewer's wrap up of most of Bob's roles up to this time. And an interesting presentation of one of the magazine's monthly portraits of the stars. 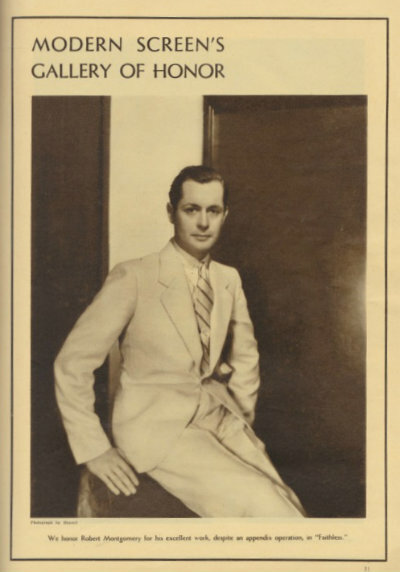 The line at the bottom reads: We honor Robert Montgomery for his excellent work, despite an appendix operation, in "Faithless". It would be remiss of one not to mention that most of the scenes he completed after his operation, involved being sick and in bed. There probably wasn't much acting going on.